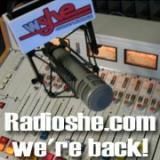 Radio WSHE has moved to the internet and is No Longer on the FM Frequency. FM Radio no longer holds listeners to support full time broadcast as latest studies have outlined. WSHE-FM Is Back Again ! It Has Been a Long Hard Road Since WSHE Ft Lauderdale/Miami Had Signed-Off The Air FM 103.5 Some 18 Years Ago. As Most Of You Know, We've Taken WSHE She's Only Rock 'n Roll To The Internet. We Are No Longer On FM 103.5, We Are Currently Strictly Internet Based And Growing Very Fast. Every Week, Our Traffic Increases, As Well As The People Tuning Into Our Broadcast. We Have Expanded Our Bandwith And We Will Be Opening a New Portal To Accommodate all Of You. Who Would Have Known That The Future Of Radio Would Be Internet 18 Years Ago.. As a Matter Of Fact, Internet Is Becoming The Conduit Of All Media. You Are Encouraged To Post Comment Feedback On This Topic, Simply Click Lower Right Bottom Of This Article. With Your Ongoing Support This Year, We'll Be Able To Continue On The Air, Bringing You What You Expect. Your Pledge Directly Tenders Bandwith, Equipment, Electricity & The Staff. Our Total Goal Peaks At $150,000.00. Our Goal Is To Continue To Grow Reaching All Corners Of The Globe. Nobody Should Be Deprived Of Being Able To Enjoy WWSHE-FM. We're Nearly Halfway There As Of March 2014 ! Thank You For All Of Your Continued Support..